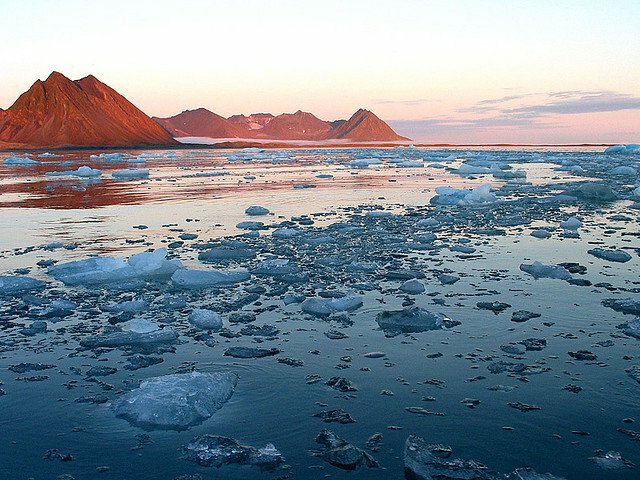 A feedback loop of melting and warming could be taking hold. The Arctic is reaching record temperatures as it enters what is known as the "polar night," when the absence of sun is supposed to accelerate freezing. During the summer, the North Pole's ice sheets begin to melt as the sun bears down on the region. When the sun retreats in the winter, the ice returns and temperatures plunge. Except this year, that pattern is being disrupted. Right now, the Arctic is 36 degrees Fahreinheit warmer than it should be. This is such a dramatic shift that it could signal an irrevocable turning point for the area. There are a few interconnected reasons for the warming. First, rising global temperatures from climate change have eroded the Arctic's ice reserves at higher and higher rates. Second, as the ice melts its ability to cool the atmosphere and stave off heat diminishes, which in turn invites more melting, and more heating, and so on in an indefinite feedback loop. Third, a particularly powerful jet stream of warm air is affecting the Arctic at the moment. The Arctic is resilient and could correct for this massive spike of heat, returning to stable temperatures for the rest of the season. But, if the past several years are any indication, the region is slated for an escalating decline. The feedback loop of melting ice and warming temperatures is already having violent effects in other parts of the world, most notably Greenland. If all of Greenland melted, sea levels would rise about 20 feet. If all of the Arctic melted sea levels would rise about 200 feet. While such a daunting scenario is unlikely in the near future, it should serve as yet another wake-up call that action must be taken to curb climate change to prevent catastrophic environmental changes. Protecting the Arctic is good for self-preservation, yes. But it's also essential for mainintaing the wonderful vibrancy and diversity of the Earth. This freezing tundra at the top of the planet hosts thousands of species that can't be find elsewhere. Losing this abundance would be tragic.